In high-school economics, we were told higher-quality products carry higher prices. Pay once. Own forever. Cancel your GREarth subscription for good. WSV3 Professional has it all. It encapsulates the functionality of Gibson Ridge's GREarth product (which they sell for $180 per year). It contains a high-performance, innovative NEXRAD Level 3 radar display section, which encapsulates the functionality of the competitor's GRLevel3 program ($79.95). And furthermore - our sophisticated and unprecented NEXRADPro Level 2 radar display engine covers the Level 2 Gibson Ridge product ($250) while going even further - innovations such as our proprietary "Beam-continuous" interpolation, real-time NEXRAD beam prediction algorithm, VeriTilt™ 3D accurate sweep display, and (most of all) LiveScan™ are all WSV3-exclusive and impossible to find in any other piece of PC weather tracking software. In fact, the only other system in the world which can display truly real-time Level 2 radar data is a $50,000+ broadcasting system entirely unavailable to average consumers who have a great need for seconds-old radar data. For these reasons, people have told us it would be a steal if we sold our product for even the same matched price as that of the Gibson Ridge suite ($510 up-front, and $180 per year after for national weather data). That wasn't good enough; our fierce drive to compete and be the best on the market has led us to 1. abolish all mandatory subscriptions for the product (leaving the subscription as an option), 2. fail to increase the one-time price accordingly given the removal of these residual payments, 3. fail to increase our product's price otherwise due to its industry-leading, exclusive features unavailable in any Gibson Ridge product (such as our prorprietary LiveScan™ technology), and 4. in fact reduce this one-time price even further to $480 - $30 less than the first year of owning the full Gibson Ridge suite while having substantially larger functionality than the latter. Even more shocking, our bold and assertive reduced pricing currently chops off $80 from even this price, leaving the whole software available for only $400 one-time payment for lifetime ownership thereafter. And free updates - always. Users who are looking for an even-more inexpensive solution will notice our competent and extensive condensed product WSV3 Core, which is currently available for purchase as a $100 flat-fee. WSV3 Core contains the "Basic Timeline Layers" tab data products - which made up 95% of the September announcement trailer that took social media by storm. Included are animated loop/real-time National Radar (with precipitation typing), international METAR observation display, GOES satellite products for over four different areas, NWS Severe Watch and Warning outlines (with fully customizable appearance), Fronts/Pressure centers, and the following surface analysis products: MSLP Contours, 10m Wind Vectors, High-resolution surface temperature, and High-resolution surface dewpoint. WSV3 Core will also retain the 3D globe display available in WSV3 Professional. 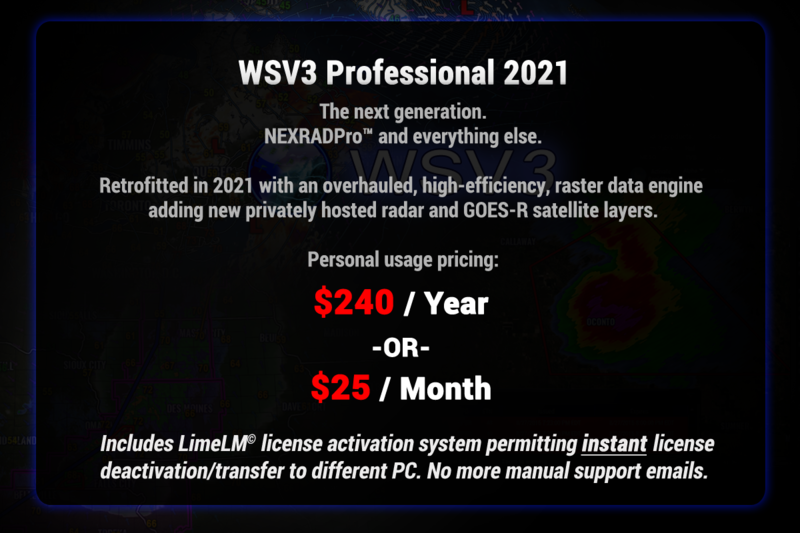 ADDENDUM (April 2016): We have added FULL NEXRAD Level 3 data to WSV3 Core in a free update. Our philosophy has been quite simple: the industry always deserved a better standard. On December 13th 2015, WSV3 debuted as the new industry-leader in the market for real-time PC weather software. We are committed to improving, innovating, and developing the product for months and years after the product's initial release through continued user-feedback-driven free updates. WSV3: The new industry standard.